Then-2008 presidential candidate Hillary Clinton campaigns in Dover, N.H., Jan. 7, 2008. It was a long time ago in an America we would hardly recognize today: Jan. 7 of 2008. The main conversation around Bill Cosby was his conservative positions, not his choice of home beverage. Tracee Ellis Ross was still Joan and not Rainbow. And Dr. Ben Carson was still just the best neurosurgeon in American history. Presidential candidate, former first lady and Sen. Hillary Clinton came in a distant third to Sen. Barack Obama in the Iowa caucuses and was in the race of her life. The New Hampshire Democratic primary was the next day on Tuesday, Jan. 8; Clinton knew she was going to win, so the campaign was already looking 4,000 miles south to the crucial South Carolina Democratic primary. Clinton was doing well in the polls in the Palmetto State; in late December of 2007 she was statistically tied with Obama 46 percent to 45 percent among African Americans, who made up half of the Democratic primary voters in South Carolina. If she could hold those numbers for just two more weeks, until the primary on Jan. 26, she would put Obama in a 2-1 hole and reclaim her crown as the inevitable candidate. Instead, on Jan. 7, 2008, Clinton effectively killed her relationship with African-American voters with one of the biggest gaffes of her political career. And she’s been digging herself out of a hole ever since. Eight years ago today, at a Dover, N.H., campaign rally, a supporter introduced Clinton with the following line: “Some people compare one of the other candidates to John F. Kennedy. But he was assassinated. And Lyndon Baines Johnson was the one who actually” passed the civil rights legislation. The introduction was a clear reference to the Kennedy-Martin Luther King Jr.-Obama comparisons that were popular at the time. The Clinton campaign was in a war of words with Obama, trying to paint him as the optimistic dreamer with no real experience, compared with Clinton’s ability to get things done in the real-world trenches. Nevertheless, the suggestion that a prominent African American with national political aspirations might be assassinated struck many voters, especially African-American voters, as the worst kind of race-baiting from the Clinton campaign. Oblivious to, or perhaps emboldened by, the introduction, Hillary Clinton doubled down on her role as the LBJ to Obama’s MLK and JFK in an interview with Fox News later on that same day. African-American voters, political leaders and journalists were shocked and offended by Clinton’s comments. She and her supporters had glibly alluded to the assassination of Barack Obama to score political points, a Freudian slip that was missed by no one. This wasn’t just a dog whistle to conservative white voters; it was a blaring Klaxon to black voters to ward them off from supporting Obama lest something … terrible happened. Worse, however, was Clinton’s apparent belief in herself as a “white savior” for black political activism. The idea that it was somehow Johnson’s blood, sweat and tears that accounted for more of the civil rights movement’s progress than the life, blood and sacrifice by King was peak savior mentality and, at worse, historically inaccurate. The political consequences of her comments were swift and long term. In mid-October of 2007, Clinton led Obama 53 percent to 36 percent among registered black voters. A week before her interview on Fox, Clinton was tied with Obama among black voters, and African Americans found her more qualified for the job than Obama (72 percent to 17 percent) and more likely to win the election in 2008 by a whopping 67 percent to 21 percent. After word got out on black radio, press and in church pews that Clinton was trying a Southern strategy, her black support evaporated. By Jan. 19, a mere 12 days after Clinton’s comments, Obama had flipped the script, leading Clinton among black voters 59 percent to 31 percent, a 15-point shift in less than two weeks. Obama would go on to win South Carolina a week later, and Clinton would spend the next eight years trying to recover from her mistake. Today, some eight years later, many politically aware African-American voters still harbor resentment against Clinton for her crucial race-baiting on Jan. 7 (and the fact that it wasn’t even the last time she referenced Obama being assassinated during the campaign). Many will point to the fact that Bill Clinton made racially problematic statements during the South Carolina primary as well, but first, Bill Clinton has a credibility with the black community that Hillary Clinton does not; and second, he’s not running for president in 2016. But despite 2008’s shenanigans, Hillary Clinton has locked up the African-American vote for the Democratic nomination and the general election. Donald Trump’s racist rhetoric has all but guaranteed that the majority of African-American voters will stay away from the GOP in 2016, and Bernie Sanders (rightly or wrongly) has never recovered from his Black Lives Matter flop last summer. However, the enthusiasm for Clinton is definitely not there. There is a real distrust, a lack of excitement and a sneaking suspicion that the woman who showed herself on Jan. 7, 2008, is still there, right beneath the smiles, laughs and convenient code-switching. 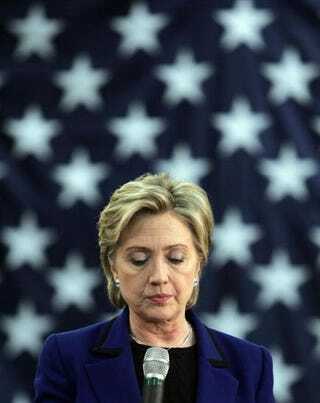 Over the last eight years, Hillary Clinton has gone through great pains to connect to the black community in the United States independent of her husband and President Obama. But she will never be the woman she was to black America before Jan. 7: a white woman who was seen as more qualified, more sensitive to African-American needs and more dedicated to black constituents than an actual African-American candidate. Mind you, she probably doesn’t have to be in order to win the White House. But when it’s all said and done, she will have to use every accent, every policy, every photo op and every black friend in her network to dredge up even a percentage of the African-American enthusiasm that she once took for granted before that fateful date.